Restrictions on teenagers' use of antidepressants have had no measurable impact on suicide rates, a study says. In 2003, regulators warned against use of the drugs in the under-18s after concerns from clinical trials that some patients may become suicidal. Bristol university analysis of suicide rates among 15 to 19-year-olds in 22 countries from 1990 to 2006 found no change in the wake of the restrictions. Antidepressant use in young people in the UK fell by 50% after the warnings. The expert committee put together to assess the safety of the drugs said at the time of the restrictions that the harmful effects of most SSRI antidepressants outweighed the benefits in young people. Only fluoxetine (Prozac) should be used and only then in severe cases, the committee said. Some mental health experts have raised concerns that limits on prescribing antidepressants may have led to increased levels of untreated depression. Research into the effects of the changing use of antidepressants has been hampered by the fact that suicide in teenagers is a relatively rare event and trends are subject to random fluctuations. In an attempt to get a clearer picture, a team from the University of Bristol looked at suicide rates in 15-to-19 year olds from 22 countries between 1990 and 2006. Overall, they could not detect any differences after antidepressant use was restricted, they reported in the journal Pharmacoepidemiology and Drug Safety. Study leader Dr Ben Wheeler said the team had set out with the hypothesis that restrictions on antidepressant use would have caused a reduction in the rates of suicide. But the results showed "no clear beneficial effect" of the regulation on youth suicide rates, he said. Some other studies in the US and Canada had suggested that falling use of the drugs had caused an effect of increasing teenage suicides after rates had previously been going down, but there was no evidence of that in this data, he added. Professor Ian Wong, a paediatric medicines expert from the London School of Pharmacy, said a survey they had done a few years ago suggested that over half of specialists disagreed with the stricter regulations. "The evidence is not that strong regarding SSRIs causing suicide but they restricted it because they said there's no clear evidence they work. "We're just starting another survey to see if they have changed their minds." 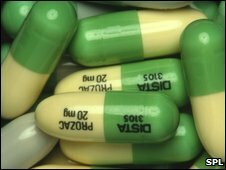 Professor David Cottrell, spokesman for the charity Young Minds and dean of medicine at the University of Leeds, said the results could suggest the risk of suicide with antidepressants was all a "big red herring", but also that the change in advice and more careful monitoring had mitigated any risk associated with reduced prescribing. "It depends which way you look at it but I think it's good news. "There's no evidence of a rise in suicide which means young people are still being treated; there's no evidence it made things worse."